Little is known about its second outlet, but one thing’s for sure—since its operations in 1997, their swiss rolls are well-loved and we can definitely get our fix from the Jewel Changi Airport outlet. There is an array of flavours for their swiss rolls, but the two flavours, however, responsible for their claim to fame are their Kaya Swiss roll and Durian Swiss roll. 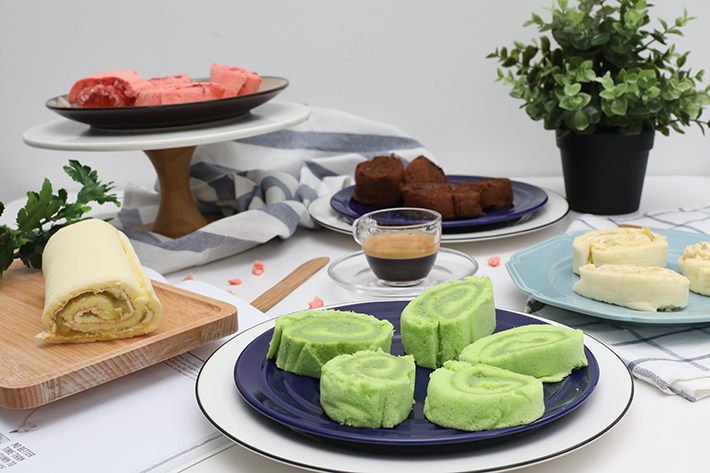 Swirled with pandan-infused kaya, the Kaya Swiss roll is, without a doubt, one of our all-time favourites. The sweet aroma of pandan, coupled by the semi-sweet coconut jam filling makes this modest-looking Swiss roll just the best tea time snack. Encased within a soft, durian-accented roll is a cream filling mixed with creamy durian. The ratio between durian cream to sponge cake is perfect, such that neither of them overwhelms the other. The roll is sweet but is nicely balanced out by a subtle saltiness in the cream itself. Perhaps, we can look forward to new flavours at its second outlet. And perhaps, there would be an extension of products. We are definitely psyched for their opening, and the next time we visit friends who are living overseas, we will definitely drop by Jewel Changi Airport to pick up some confectionery so that our friends can have a taste of home. Read: Jewel Changi Airport Food Directory – 111 restaurants, cafes and eateries to dine at.